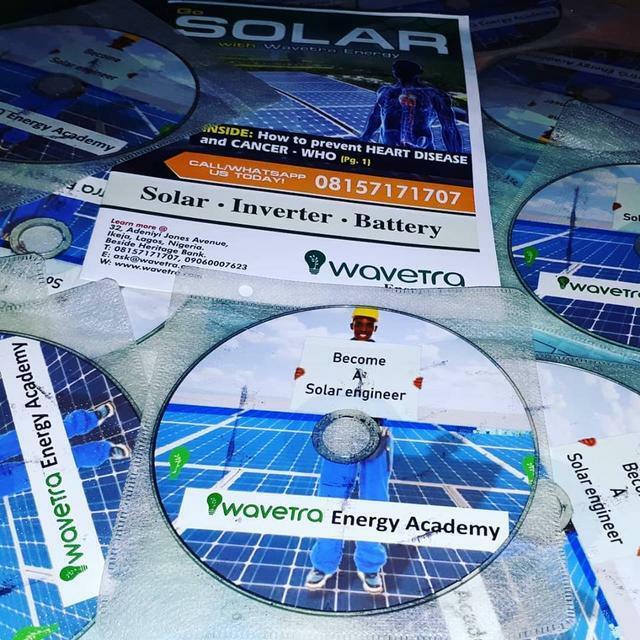 Solar energy training in Nigeria Solar energy training in Nigeria — Wavetra Energy LTD.
Wavetra Energy Academy is a leading training institute for anyone interested in Renewable energy and solar energy in Nigeria. We offer standard hands-on and theoretical training designed to bring beginners to a professional level in solar Photovoltaics principles, design and installation. Our solar installation training courses are designed to guide you as you prepare for a job in solar energy — from the theory and science behind photovoltaics through the advanced skills needed to safely and effectively design, size and install a full solar PV array. Boost your CV with this skill. Employers pay more attention to your skills than all your degrees put together. You definitely need to be trained in order to become a renewable energy consultant and solar installer. As a solar installer, you will be able to determine the design of the solar panel array. You will also be able to size the system and even install. There is a huge opportunity in renewable energy and NOW is just the right time to get your hands into it. Wavetra Energy Academy course is designed to launch anyone with science background in O'Level into solar power generation. It is especially highly recommended to anyone in construction, roofing, etc. There are numerous opportunities for anyone to succeed in the field of solar energy. We share FREE data CDs 💿 to participants of Wavetra Energy Academy. The content of this disk is worth over $1,000 but it's free and part of what you get from Wavetra Energy Academy to completely equip you in your new career. FREE DIRECT CONTACTS OF WHOLESALERS, MANUFACTURERS AND IMPORTERS OF SOLAR SYSTEM COMPONENTS. Understand the various types of Inverters: Pure Sine wave and Quasi-Sine wave inverters. Understand and learn to install PWM and MPPT Solar charge controllers. Understand the various types of Solar Panels: Polycrystalline, Amorphous & Monocrystalline Technologies. Understand Inverter & Solar Panel Specifications. Course Contents & Schedule. Acquire entrepreneurial skills on how to launch your own career in Solar/Renewable energy. Click on the registration button below to register. Call/Whatsapp for more information 08157171707 COURSE OUTLINE: Please view the full course outline here. How much is the training fee and duration of the training? Thank you all for your interest in Wavetra Energy Academy solar training. Please click on the REGISTER link to get started. You can as well Whatsapp/Call 08157171707 for more information. Please what is the duration of the training?